Vanilla, Rum & Pear – Oh My! 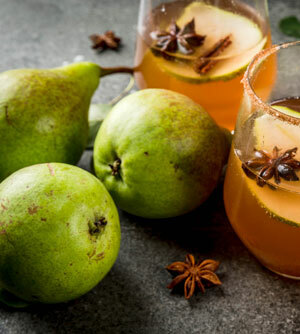 Place the chopped pear in the bottom of a muddling or mixing glass; use the muddler to press out all the juices. Strain and divide the pear juice into two lowball glasses filled with ice. Divide the remaining ingredients into the two glasses and stir each well. Garnish with the zest of a clementine, a slice of pear and cinnamon sticks. Next2018 North Brunswick Holiday Happenings!